I hope you've had a chance to go through the conference notes that have been posted on the Chinook Update. If you begin here and scroll down, you'll get most everything. So fun to catch up with old friends, Lois Brandt, Jeanie Mebane, and Allyson Shrier. 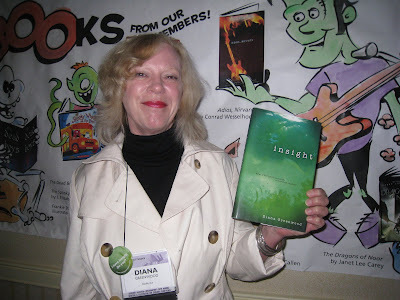 And it was great to meet the Blueboarders (sorry, no pictures) and see Diana Greenwood modelling her new book, Insight. 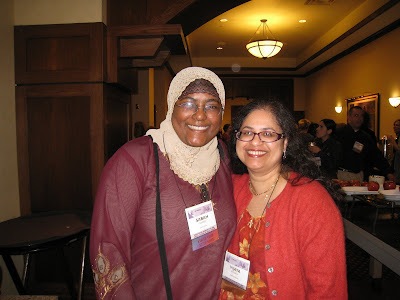 I also made a new friend -- Sabah. We had a great time relaxing during the wine and cheese reception and sharing stories about our families. 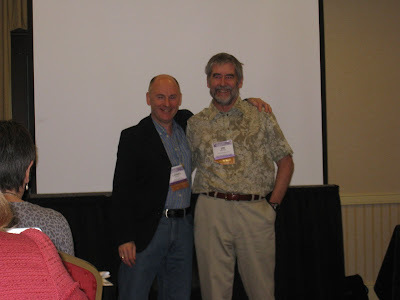 I do have some writerly thoughts to share :) I went to a nonfiction intensive led by Lionel Bender and Jim Whiting and although I've done a fair bit of work-for-hire, I didn't realize how many books are made by book packagers -- about 30% of the children's market, I believe. So, if you like to work on a team and write market-driven books (fast!) consider not only approaching publishers but also book packagers. Jim's notes are excellent and I enjoyed hearing how Lionel became a book packager. Deborah Wiles spoke about writing from the head, the heart and the gut -- what you know, what you feel and what you can imagine (or cannot bear to imagine). 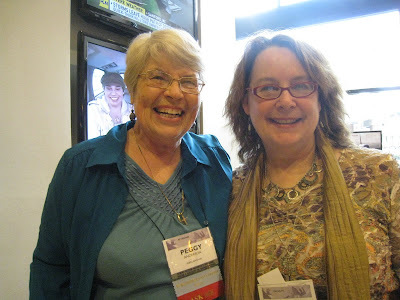 I went to her workshop on revision and she pointed us to George Ella Lyon's Where am I From? Powerful stuff. Deborah said that when you are stuck, write your own poems like Lyon's because the better you know your own story, the better writer and reviser you will be. Here she is with Peggy (more about her later). 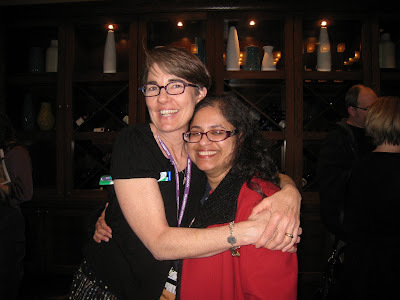 The two agent talks I went to -- Tina Wexler and Sarah Davies -- were both extremely organized and informative about the books they like, including the heart-stopping factor. 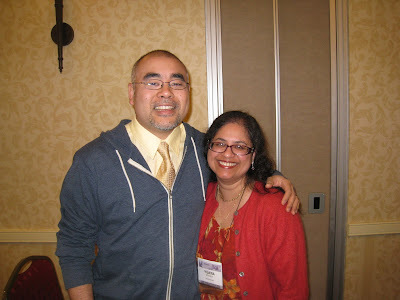 Years ago Tina (then duBois) had contacted me after I won the YA writing contest, but I was not ready to even think about an agent. I was doing a lot of magazine and work-for-hire and my novels were unpolished. I'm glad I didn't send her anything then. Five years make a difference. And Sarah Davies ought to write a book on writing. She's a marvelous storyteller herself and I found myself thinking of Ian McEwan while she told her grandmother's story. Lucky for us, she keeps a blog where she shares her knowledge unstintingly. I loved Holly Black's keynote on plotting. She was funny and I saw how useful it is to *talk* out a novel. I'd never done this until my recent one and it's the best one so far because my partner, Jen Heger, keeps me honest. "Nah," she'll say, "your character wouldn't do that." Holly also talked about weaving subplots and it was great fun to have a demo together with Holly and E. Lockhart on a dragon story. Good stuff. Dan Santat was so honest and vulnerable. He made us all cry. I see so many parallels between him and my son, who loves art. And here I am, the typical immigrant parent, thinking, he needs to have something practical to fall back upon. I truly hope that I'm the kind of mother who will nurture his talents. My sister and I were talking about this very topic, and how both of us gravitated towards the arts, even though we were the practical sort (out of necessity, of course). Follow your heart, your calling. 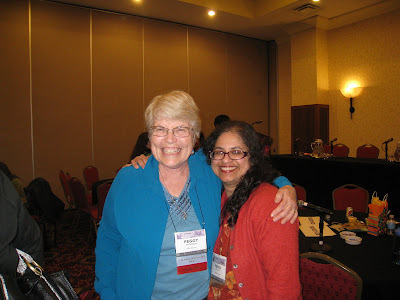 I was beyond thrilled to see Peggy King Anderson recognized for her years and years of hard work and dedication and nurturing writers. 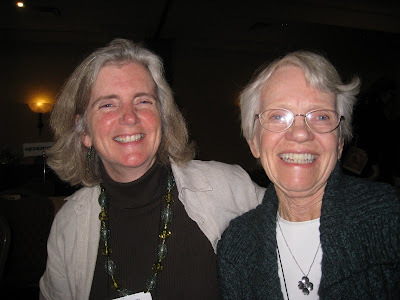 She was my first writing teacher and she told me very early on that I was a novelist hiding behind the short story. She's right. There are some stories you simply cannot fit into the short form, and so I am learning to write bigger books. She has taught me so much and I will always be grateful for all she's done for me. It was lovely to go to Palm Sunday Mass with her right after the conference; the perfect way to end the conference, bringing the focus back to Jesus, His Passion and why I am here in the first place. I missed saying goodbye to many folks, but we really did have to shoot out of there after Holly's keynote. I could write loads more; I have an entire notebook filled with my chicken scratch, but I'm sure you've had enough. 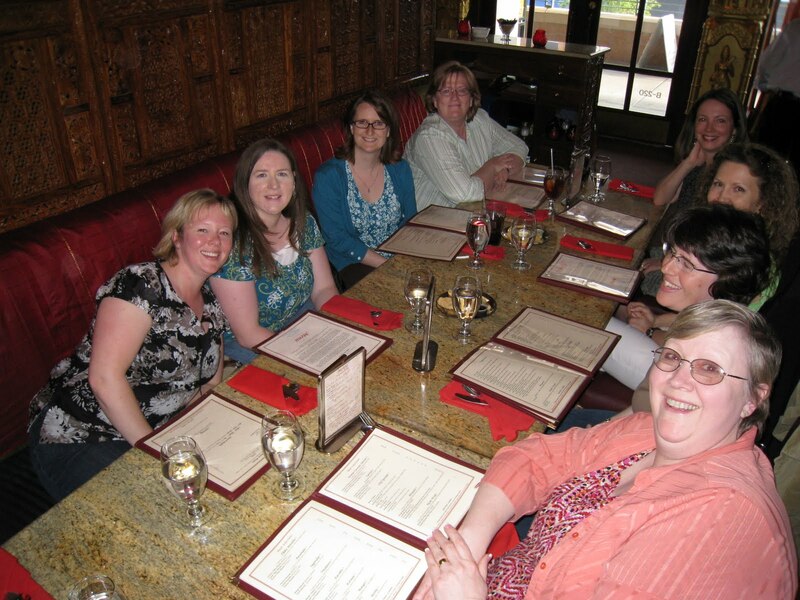 I'm so blessed to be part of such a vibrant regional SCBWI chapter. Thank you all for your hard work in making the conference such a wonderful experience. Conference time! 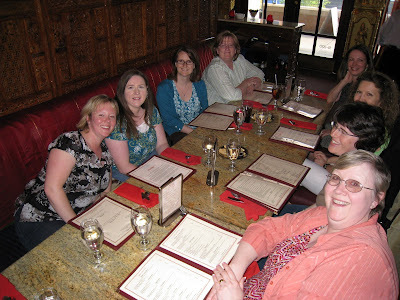 Our local SCBWI chapter rocks. So fun to meet with friends I've made on the Blueboard. We'll be meeting again: at Desert Fire 5:30 pm Friday. If you're in the area, feel free to join us. You don't need to be registered for the conference for this. 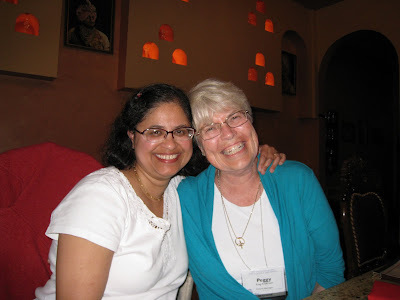 Here's my first writing teacher, Peggy King Anderson, and me. If you haven't taken a class from her, you're missing out. Check out her newly designed website. It's got bells and whistles and great writing tips. I found the cutest website about Writers and Kitties. Check it out. I'm all set for a weekend of inspiration and learning and getting together with old friends and new. See you there! 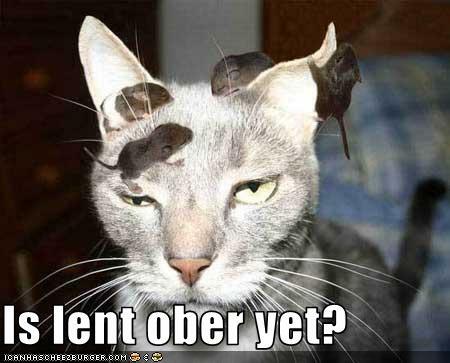 We're halfway through Lent. I fail daily at keeping my resolutions, but I pick myself up and try harder again. Developing good habits takes time and I although I feel like this cat some days, most days, I am happy to spend greater time with our Blessed Lord. 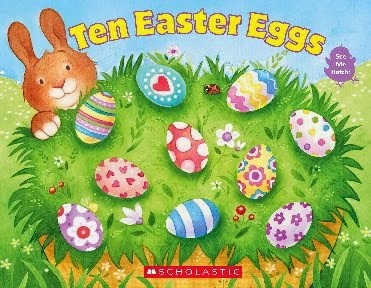 Today I am giving in to temptation so that I can share all the great books I've been reading. 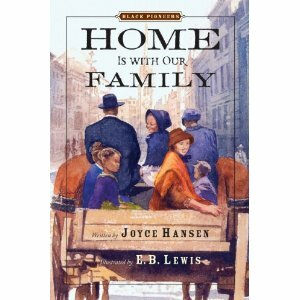 I loved Home is with Our Family by Joyce Hansen because it so vividly portrays family life at a time that I don't know much about. My kids soaked up all the details of how school was conducted. And I thoroughly enjoyed reading a book about black Americans who were relatively well-off and who did not have a dysfunctional family. The illustrations by E.B. Lewis are gorgeous. It's a beautiful book to read. Long after I closed this book, I wondered how Maria and her family fared in the Midwest, and whether Anna and Maria were able to keep in touch. Their homes, gone, replaced by Central Park. Hansen is unsentimental, letting us into the hearts of her characters. I thoroughly enjoyed Moon Over Manifest by Claire Vanderpool, taking me into two times and places, and again, what it means to be a family. I loved the way Vanderpool peeled the layers of this onion to reveal the hearts of the characters, the mystery I never suspected. Book of the Maidservant by Rebecca Barnhouse was sheer delight. It's based upon the pilgrimage of Margery Kempe from England to Rome, but from the viewpoint of her maidservant, who Margery described in her autobiography as disobedient. Again, the details of their lives on the road with their fellow-travelers created a picture for me that I will not forget soon. As you can see, I enjoy historical fiction very much and I must admit that I've learned more history by reading historical fiction than dry history books. Oh, there are some exceptional authors I've read, like Steven Ambrose or David Halberstam, but I'm afraid the vast majority of history books do not appeal to me. Other books I've enjoyed are the Latin-English Missal, since we try to go to High Mass at least once a month. There is so much Beauty and Sacred Tradition that I didn't know I was even missing. We will probably invest in the 1962 Daily Missal eventually. In The Seven Capital Sins, Fulton Sheen reflects upon the seven Words of Christ and correlates them to the reparation of the seven sins. 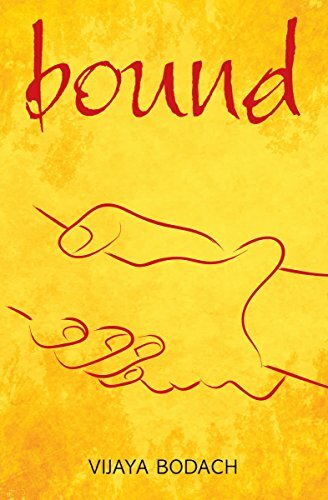 In our culture, the idea of sin has practically vanished in the name of tolerance, so this slim book is a must. I've also been enjoying Word Work: Surviving and Thriving as a Writer by Bruce Holland Rogers. It is not a book about the craft of writing, but about becoming and staying a writer. I highly recommend it. My reading pile is ever growing ... I can't wait to get my copy Between Shades of Gray by Ruta Sepetys and The End of the Line by Angela Cerritos. My own writing is going well too -- I'm now revising the second half of my book. 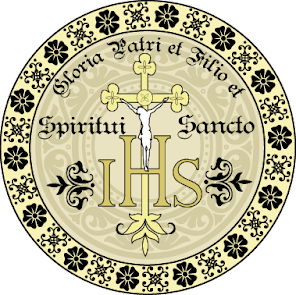 I hope you have all found something in here that piques your interest, and I hope you will continue to have a blessed Lent.